Here’s some quick thought-leadership advice on your content marketing campaign. I see clients and potential clients fall for this short-term fix all the time. Don’t allow other competitors or industries to leverage your own blog and the exposure it brings. I received an email this weekend from a publicists, asking if she could write a post for our company blog. Here was her request, and why you shouldn’t fall for a similar request. The best PR firms continually brainstorm on the most creative angles for news stories. We do it for clients and we do it for our own PR firm. I was recently on the PIX 11 Morning Show in NYC, promoting a mobile app that MACIAS PR created for consumers. Our mobile app, Blush No More, gets consumers into the conversation when they run out of things to say. (You can watch the video below). What happens when you run out of things to say at that cocktail party or networking event? You turn to Blush No More for conversation topics that keep the conversation moving forward. For MACIAS PR, this app provided our firm with a new narrative that got us on local TV in several markets. Our campaign also led to prominent international news placements with Yahoo China, GQ in Germany, The Daily Mail in the UK and others. 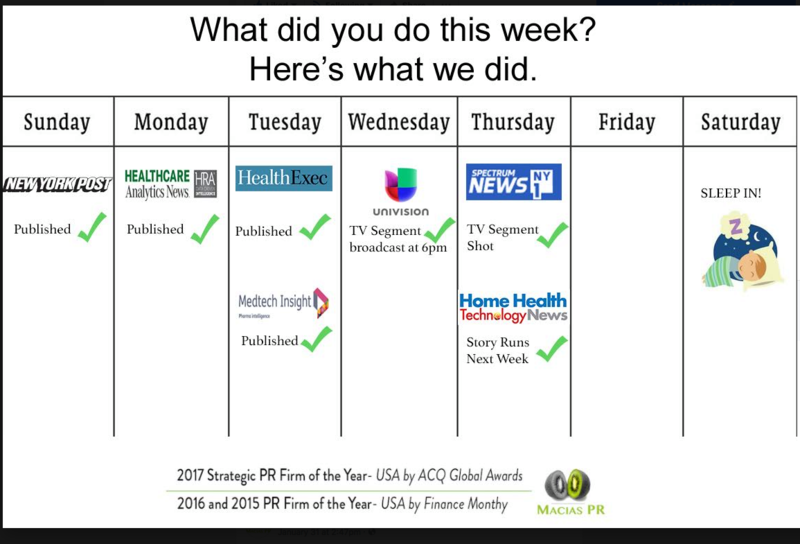 So how does this international, national and local coverage help MACIAS PR? Potential clients are ambitious when it comes to publicity. They frequently tell me they want their products to reach the biggest audience on TV. You can’t blame them. Bigger is usually better, right? Actually, that’s not always the case. You want to place your product where your consumers and clients are located. It sounds simplistic enough, but it’s over-looked as a strategy when it comes to PR. Your PR strategy should align with your goals – first. I run a business, so I understand the pressures of your business. Publicity is likely a crucial component of your business growth, and the entire MACIAS PR takes that responsibility to heart. As I tell our team, our clients are relying on us to get the message out. Just like our business has to grow, we need to help their business grow. MACIAS PR publishes quarterly media reports that detail the publicity we continually secure for our clients. I do that because I want to be transparent with all potential clients. PR firms frequently get a bad rap of operating under a cloud of mystique. It’s not like that with MACIAS PR. We put our record out there for everyone to see and scrutinize. MACIAS PR has produced sales and promotional videos for clients in both the B2B and B2C space. We crafted their message, shot their interviews, produced and edited the videos within their brand guidelines. Our team has worked with tech and healthcare startups, as well as larger organizations in the B2C space. MasterCard, the Gansevoort Hotel Group, the Observer Group and the Soho House are some of the bigger-named brands that we worked with to promote their story to consumers. You can see some of our stories on Youtube. MACIAS PR recently produced a sales video for a B2B healthcare client, helping them craft a message that introduced their services to healthcare providers. It helps to have a short visual that demonstrates the value of your product when the message is complicated. The finished video explains the value behind their product.